As the summer heat turns up in parts of Asia, Europe, and North America, beaches and other popular vacation destinations are rapidly getting packed with tourists who want to take a great relaxing trip and get away from the busy city life. Many people engage in different water activities such as swimming, diving, snorkeling, surfing, and kayaking in order to stay cool during the summer season. Because of the basic equipment and skills required, as well as the limitless fun that you can get, kayaking and surfing became two of the most popular and well-loved water activities for families, friends, couples, and even for solo travelers. Getting your own paddle board is one of the first things that you should consider before engaging in water activities such as surfing, kayaking, and much more. In buying the perfect paddle board, you have the option to buy an inflatable type which is more lightweight, easier to store, and more convenient to carry around. Check out these five useful tips to choosing the best inflatable paddle board for this summer. You may also read comprehensive inflatable paddle board reviews to help you make a better decision. 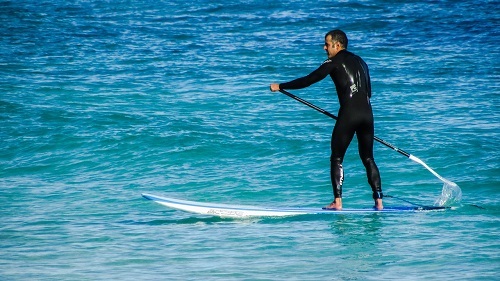 Paddle boards are specially designed to suit different types of water activities. There are wide boards for family recreation, surf boards which can be easily maneuvered around waves, yoga boards with improved stability, fishing boards with more volume, and all-around paddle boards which you can use for different activities. The size of the inflatable paddle board affects its overall performance. With a larger space and increased stability, wide boards are perfect for family recreation and yoga. Long and narrow boards offer more speed which is needed for racing. On the other hand, short and narrow boards provide both speed and ease of turning for the benefit of surfers. Paddle boards have fins at the bottom to aid in tracking and stabilization. Some have one large fin in the middle of the bottom side while others have two additional smaller fins on both sides of the larger one to maintain stability over rough waves. Fins may either be detachable or permanently attached and they can also be made of high-performance fiberglass or high-durability nylon materials. The nose rocker (how far the front of the board curves upward) and the hull shape also affect both the speed and stability of a paddle board. Although inflatable paddle boards are less prone to sinking than conventional types, high nose rockers can help prevent the paddle board from plunging down the water. Flat bottom boards are stable and easier to turn while displacement hulls, which are pointed, can easily slice through the water at faster speeds. In contrast to regular paddle boards, inflatable paddle boards take more time to set up. You need to increase and keep the pressure at 12 to 15 psi and you also want to make sure that every part of the board and the fins are inflated well and are in good shape. Typically, 5 to 10 minutes of set up time is all it takes for a medium-sized inflatable paddle board. This entry was posted in Other Sports, Water Sports and tagged Paddle Board, Paddle Boarding. Bookmark the permalink.